Arduino Pro Mini is a mini-sized model of Arduino board, with same functionality as Arduino Uno board, but negates serial communication via USB feature. So, it’s really 'running mode' as main function of the board. For 'development mode' you will need additional circuit board USB to serial TTL such as FTDI not CDC (Communication Device Class) one. Arduino Pro Mini board suitably for electronic products is fixed by design so it no longer needed to be re-programmed. It could be said also that the board is the 'minimum system' to run an Arduino project. Arduino Pro Mini board is available in two versions on the market based on kind of working voltage: 3.3V and 5V. Aside from working voltage, all pinouts and functionalities are exactly same, except the crystal resonator. If 3.3V model use XTAL (Crystal) 8 MHz, the 5V version is implanted 16 MHz XTAL. Which of the two should be used, depend on requirement of your system. 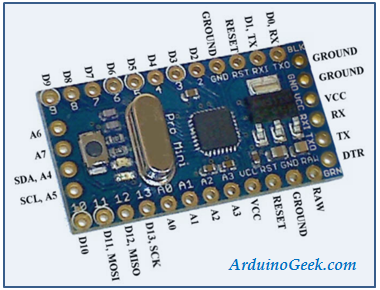 In this tutorial, I will cite how to upload a sketch to Arduino Pro Mini 5V models. To upload a sketch on the board, you will need a USB to serial TTL/UART FTDI version, which has a DTR and CTS pin. So, USB to serial TTL that have only Tx and Rx pins like CDC version (for example PL2303) can’t be used for this purpose. 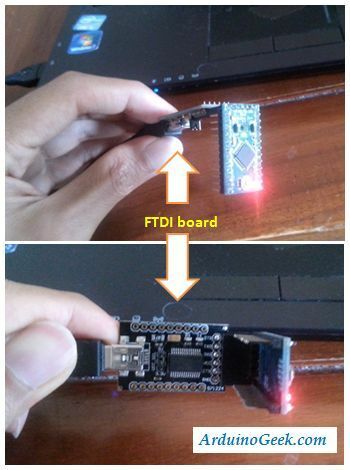 If all tools and materials are ready, connect USB to serial FTDI board to Arduino Pro Mini with the connection configuration as shown below. If so, connect the USB cable from serial FTDI USB to your laptop. Make sure the drivers are installed. How to be sure, look at Device Manager in Control Panel, if the driver is already installed, there should be a COM port to read there. Then you can upload the sketch as usual, by pressing arrow icon in top toolbar menu or by pressing CTRL + U shortkey. Wait a moment until there is an inscription 'Uploading Done' at bottom of debug window on Arduino IDE, which indicates the sketch uploading process is complete.